Browsers, Clouds & Computing: The Power of CSS (at the Open Web Camp, 2011). The Power of CSS (at the Open Web Camp, 2011). 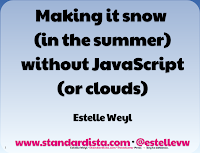 If you are a novice to CSS, you will like this presentation by Estelle Weyl, which I attended yesterday at the Open Web Camp, 2011. If, on the other hand, you know a little of CSS, you'll love this presentation! Shkrubbel, using web technologies to build a multi-player word game, by Kitt Hodsden. Kitt is a vivacious speaker. The Future of CSS - Current Experiments and Near-Future Reality, by Tab Atkins. Tab has advanced knowledge of what is happening in the W3C CSS community, because he is a member of the W3C CSS Working Group, among others, while being a software engineer at Google. Open Web Camp attracts a good community of web developers, thanks to its sponsors for free admission.